Oh you forgot. He wants to have turbines being run on zombie power by dangling brains in front of the zombies’ faces, and he wants to get ‘top secret’ teeth police to come knock on our doors at 3AM to make sure we’re brushing! 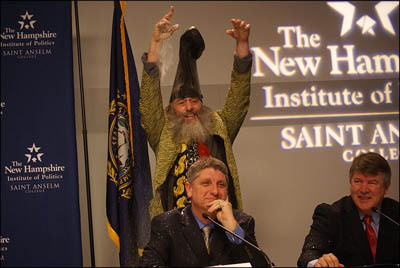 I LOOOOOOOOVE Vermin Supreme. Even though i am not old enough to vote, I would. Actually . . . Are you a republican? I . . . HATE . . . Rupublicans. Sorry. So I guess I kind of hate you now! Soooooooory!!!!!!!!!!!!!!!!!!!!!! !